Do the Eight Palaces Hold A Solution To King Wen's Sequence? Previously, I analyzed the King Wen pairs as they played across the Jing Fang arrangement of the i-Ching, also known as the Eight Palaces arrangement. I charted the King Wen pairs as they are arranged in Jing Fang, and the result was striking. The Eight Palaces is based on eight rows, each "ruled" by one of the eight trigrams. Each row starts with doubled trigram (1, Heaven over Heaven, 2, Earth over Earth, etc.). 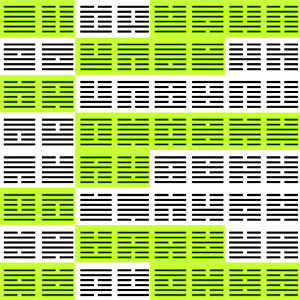 One line changes in each hexagram as you progress from left to right through the seventh column. From the seventh to the eight, the bottom trigram changes to its complement (yin-yang opposite). For the entire eight-by-eight square, the top half is the complement of the bottom half. So the Jing Fang sequence is a structured sequence with logical rules, and the King Wen pairs overlaid on the diagram also follow rules, and rather interesting ones at that. The pairs are evenly distributed in two patterns -- half are vertical lines and half are diagonal lines, with the diagonals all passing through a single vertical line. 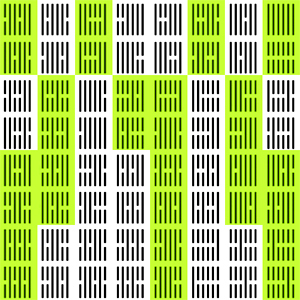 The vertical lines include the following hexagram pairs: 1-2, 5-6, 7-8, 11-12, 13-14, 17-18, 27-28, 29-30, 31-32, 35-36, 41-42, 51-52, 53-54, 57-58, 61-62, 63-64. The astute observer will note that this includes all of the doubled-trigrams (1-2, 29-30, 51-52, 57-58), but it also includes an assortment of other hexagrams whose pattern was not immediately clear to me. Eventually I figured it out. Here's the trick. Imagine the Fu Xi circular diagram not as an eight-point compass, but as two four-point compasses. For the sake of coherence, I am just going to call them "red" and "blue" for now, but we'll work on that later. As seen in the compass at right, the Red Compass, or axis, consists of the trigrams Heaven-Water-Earth-Fire, and the Blue Compass consists of Lake-Wind-Mountain-Thunder. In the vertical line pairs on the Jing Fang diagram above, each hexagram is drawn exclusively from one compass or the other, i.e., the hexagram is either all red or all blue, and never a mix of the two. So Heaven over Earth, for instance, is Red, while Lake over Mountain is Blue. In other words, there is a distinct structural difference between the diagonals and the verticals. The diagonals are all "mixed" hexagrams -- drawing one trigram from the red compass and one from the blue compass. So, for instance, let's look at hexagrams 9 through 12. Nine and 10 are diagonals, 11 and 12 are verticals. Because we'll be switching diagrams shortly, let's set some terminology. The vertical pairs -- which do not mix red and blue trigrams -- we will refer to as "polar," because they conform to a single compass. The diagonal lines mix between the red and blue compasses, so let's call them bipolar. All this might say a lot about Jing Fang's sequence, but the question this article seeks to answer is: Does it say about King Wen's sequence? I believe it does. Below is the King Wen sequence laid out as an 8x8 grid. I've highlighted the polar pairs. The significance of this pattern may not be evident unless we rotate the diagram 90 degrees. What we have here is a broken symmetry -- the polar pairs form a symmetrical grid across King Wen's sequence, or rather they would, if not for two pairs that are "misplaced" -- 29-30 and 39-40. 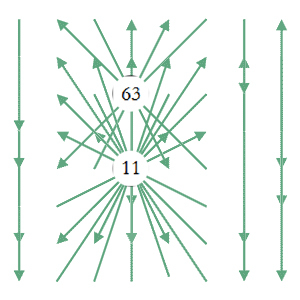 In the rotated version of the diagram above, the symmetry runs down the vertical center of the diagram -- mirror image left and right. If you exchange the two cited pairs, the symmetry becomes perfect and the weight of each line becomes consistent -- with four polar pairs and four bipolar pairs each. The diagram is show below. And here's the same diagram rotated 90 degrees to the right to make the symmetry more visible. Although I am using the word "misplaced" here, it is not my intention to say the King Wen ordering is wrong. Rather, the opposite -- I believe the symmetry break is deliberate. I think the key to understanding the logic of the King Wen sequence lies in understanding the effect of the symmmetry break on the ordering of the sequence as a whole. The easiest way to proceed is to examine the "corrected" symmetrical version. The human mind can more easily identify patterns that are symmetrical and possess some degree of regularity. Once we've picked apart the symmetrical version, we might be able to identify how the pattern is modified in the assymetrical original sequence. Let's look at the polar hexagram pairs alone. I've arranged the polars below according to quadrant -- i.e., the arrangement below is what you would get if you pulled out all of the bipolar hexagrams from the "corrected" King Wen, then slid the tiles together. The first and fourth quadrants are made up entirely of complementary pairs -- pairs in which the first hexagram is the yin-yang opposite of the second hexagram. This suggests we should be thinking about Wen's structure in terms of quadrants rather than a linear sequence of 1, 2, 3, 4, etc. So let's go back to the "corrected" Wen grid. We can now identify a structural symmetry across the center line, in which the distribution of polar pair sets on the top and bottom reflect each other along the horizontal axis. We have another, different, structural symmetry in which the complementary pairs appear only in the top left and bottom right quadrants. The two corners anchoring the complement symmetry are, at top left are "Initiating" and "Responding," and bottom right, "Already Completed" and "Not Yet Completed." These two pair sets, the first and last, are one of the few traditional elements that even hint at any sort of cohesive structural order in the King Wen sequence. To my mind, this echoes the directional numbering found in the traditional Fu Xi circular arrangement, as shown in the illustration below from Alfred Huang's The Numerology of the i Ching. A few words on the "correction" of pairs 29-30 and 39-40. As I said before, I don't mean to indicate that I think the King Wen sequence is wrong. Rather, I want to examine the pristine symmetry and compare it to the broken symmetry to discover why it has been broken. Hopefully this will eventually lead to an actual solution for the whole set -- a goal of which this effort still falls short. I think the pattern here is strong evidence for a structural design in King Wen, but it's not yet an explanation of that design. The key, I believe, is that the i-Ching is a dynamic system of processes. In previous analyses, I've compared the Earlier Heaven and Later Heaven compasses by analyzing how the King Wen pairs chart using each. What I found was that the Earlier Heaven, a carefully balanced primal ordering of the trigrams, yields a crystalline and largely stable mandala. The Later Heaven, which is unbalanced and generally taken to represent temporal processes, yields an unbalanced but much more dynamic mandala. In my opinion, the balanced structure is primal and largely abstract, representing universal rules of organization. The unbalanced structure represents temporal processes -- processes as they unfold in spacetime, or rather, in the real world. In science, balanced equations are very good at describing the action of principles -- such as Newton's famous axiom, "For every action, there is an equal and opposite reaction." But these balanced and linear equations don't hold up well in describing organic processes, such as the development of life. For this purpose, you need imbalanced equations -- fractals. I see the balanced grid produced by the Earlier Heaven arrangement as the equivalent of Newton's third law. I see the imbalanced grid produced by the Later Heaven arrangement as more akin to chaos theory. Seen in this light, the break in King Wen's symmetry becomes of paramount importance. A balanced arrangement, in the end, will play out the same exact cycle over and over again, endless repetition. An imbalanced arrangement, however, will produced different results from cycle to cycle. The imbalance is what allows complexity to develop, and the integration of that imbalance into King Wen's sequence -- in a very careful and precise manner -- allows the sequence to produce complexity. Repeated gorge, possessing conformity. Holding-fast the heart. Growing movement possesses honor. Streams reiterated culminate. Repeated gorge. A jun-zi uses constancy in actualizing dao to move. And repetition to teach affairs. The radiance. Harvesting. Trial. Growing. Accumulating fertile cattle. Significant. Brightness doubled arouses the radiance. The great in the person uses consecutive brightening to illuminate tending-towards the four sides. Limping. Harvesting: Western South. Not Harvesting: Eastern North. Harvesting, viewing the great in the person. Trial. Significant. The mountain possesses stream above. Limping. A jun zi uses reversing individuality to renovate actualizing-dao. Unraveling. Harvesting: Western South. Without a place to go: One's coming return, significant. Possessing directed going: daybreak, significant. Thunder and rain arousing. Unraveling. A jun zi uses forgiving excess to pardon offenses. I'm not going to attempt to parse every word of these four passages at this time, but I did want to note a couple of interesting turns of phrase. "Renovation" in Hex 39 is the only occurrence of this word in the entire i-Ching, according to concordance in the The Original I-Ching Oracle. The original Chinese word is "XIU" and it can be read as "repair, mend, improve, adjust or regulate." The concept of "mending" the broken symmetry is very appealing here, and as noted, this is a unique word within the text. The idea of "regulating actualizing-dao" fits in with my comments above regarding primal vs. temporal organization. The swapped hexagrams might represent a sort of timing mechanism, a beat counter, or the iterations of a fractal. In that case, we should look for the structure spreading out from the center of the 8x8 grid and not sequentially from Number One. Without trying to explain it right now, I will say I was also struck by the phrase "The great in the person uses consecutive brightening to illuminate tending-towards the four sides." It strikes me, on a mostly intuitive level, as being a clue to the structure of what's going on here. One final note: When correcting" the grid I simply exchanged the two pairs (29-30 and 39-40) without changing their internal order. A "correct correction" might place 29-30 in its new location as 30-29, for instance. So if you're looking for the pattern, keep that in mind.